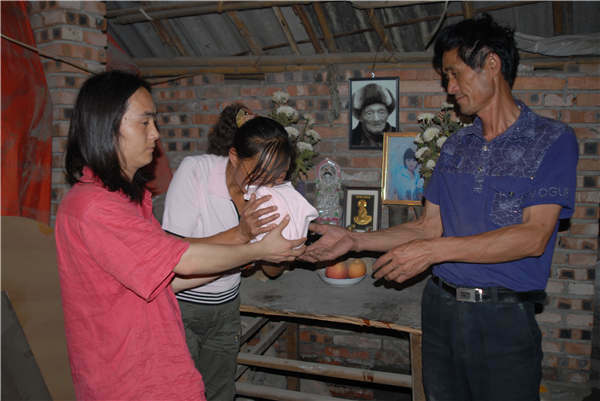 Parents of twin girls donating the ashes to Shu Yong, which the artist blended with clay to create flower sculptures. The controversial ceramic sculptures by artist Shu Yong commemorating the 2008 Wenchuan Earthquake, has been donated to a museum at the site of the tragedy. Cheng Yuezhu reports. A decade after the 2008 Wenchuan Earthquake, the Flowers of Life sculptures, made from the ashes of twin girls who died in the earthquake, finally lie peacefully at the Memorial Museum of epicenter Yingxiu. The three ceramic flower sculptures by artist Shu Yong were donated to the museum on Wednesday. Shu is an internationally renowned Chinese environmentalist who has won Lifetime Achievement Awards at both Florence Biennale 2009 and Expo 2017 Astana. The Flowers of Life work is an alternative way of continuing and preserving the lives lost in the Wenchuan Earthquake, expressing people's reverence for life and a collective reminiscence, according to Shu. Speaking about the sculptures, Wang Na, head of Wenchuan county, says, "Now is the appropriate time (to accept the donation which was deemed controversial earlier)." Speaking about the mayor's comments Shu says: "Her answer is interesting. I think 'appropriate time' has two layers of meaning. First, the 10th anniversary (of the earthquake) is a milestone. Second, the broad social background has changed." When the earthquake struck Sichuan province on May 12, 2008, Shu was preparing for his first overseas solo exhibition, Shu Yong－Bubbles at Galerie Urs Meile, Switzerland. But he went to the Jungfrau to pay silent tribute. "When I looked up I saw a beam of light resembling a pure white flower", he says, referring to his inspiration for Flowers of Life. Speaking about the project and the first hurdles he faced, he says: "With such a disaster, where so many people had suddenly died, there is the unavoidable question of how to handle the bodies. So, I thought it was better for them (the remains) to be turned into something everlasting." But on arriving at the disaster site, Shu's artistic ideal was quickly overcome by brutal reality. "I was overwhelmed by the sight of the wasteland, the pain of the people and the odor of corrupting corpses. I felt pathetic for adding to the pain of the living." So, Shu put his plans on hold and started giving the victims material support. And when distributing food and necessities, he encountered Zhao Deqin, the mother of deceased twins, Qiqi and Jiajia, both of whom liked Shu's work and dreamed of becoming artists. Seeing this as a sign, Shu proposed the idea of immortalizing the twins through art, and Zhao agreed. But the production process soon faced multiple obstacles, including the prevalent public misconceptions and verbal abuse for the artist and the parents. Meanwhile, due to other artists' unwillingness to cooperate with him, Shu had to learn pottery making from scratch. 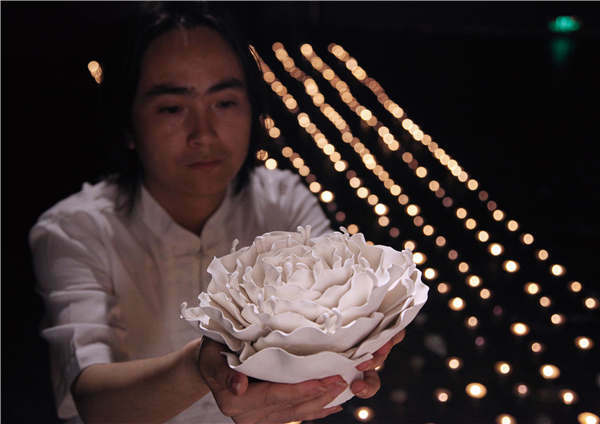 Later, blending the ashes with clay, Shu created three ceramic flower sculptures of different sizes. "It (the works) use an artistic form to commemorate the lost lives", says Wang. The shape of the works is based on a variety of flowers, designed to showcase tolerance.